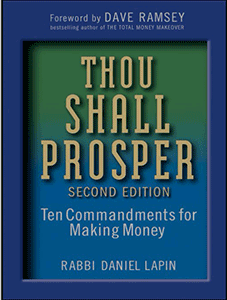 Thou Shall Prosper - The Ten Commandments For Making Money has been on my list to read for quite some time now. I first heard it mentioned on The Dave Ramsey Show and the author, Rabbi Daniel Lapin, has also been interviewed on the EntreLeadership podcast. I recently got caught up on this part of my reading list and very much enjoyed taking in some "old fashioned," but very relevant wisdom. As my friend Alan K'necht pointed out in his book, The Last Original Idea, "... there is nothing new under the sun." While the ideas Rabbi Lapin shares in this work are based on very old wisdom, they still translate very well into modern times. Throughout it all, misconceptions and bad ideas about business are busted and replaced with good ideas. ... dishonesty and loathsome behavior only pay off in the very short term. Reputation is key. Sooner or later, the cheating, dishonest, and unpleasant business professional runs out of people with whom to conduct business. This is quite true - especially in today's culture online. It doesn't take long for someone's bad reputation to spread and for people to decide not to do business with them. If there is one Jewish attribute more directly responsible for Jewish success in business than any other, it is this one: Jewish tradition views a person's quest for profit and wealth to be inherently moral. Biblical figures are almost all larger-than-life, three-dimensional personalities. Although the Oral Torah describes many of them as fabulously wealthy, this does not usually emerge directly from the text. This is because wealth is considered to be the consequence of a life well live, in the company and companionship of others doing the same, rather than a purpose of life in itself ... Wealth was consequence and not a prime purpose. Some people mistakenly assume that a transaction can only take place if one side withholds information from the other. They assume that a transaction constitutes one party outsmarting another. This is a failure to understand that when two parties sculpt a true transaction, it is one one party taking something from the other, but two parties cooperating to create entirely new wealth. The transaction is more likely to take place if both parties understand that nothing needs to be hidden. Furthermore, the transaction is more likely to be successful if each party trusts the other and feels confident that no material facts are being withheld. "Learn To Foretell The Future" was an interesting chapter. In that section, Rabbi Lapin discusses the Sabbath and why it's a good idea to take time out to rest and clear your head sometime during the week. In our frenetic culture, everyone is overtaxed and stretched to the limit. The ability to dial down, unplug and relax is important to help you see things that may affect your business in the future. The "Never Retire" section reminded me of an acquaintance of mine. "Frenchie" was very active in the amateur radio club I was part of when I lived in El Paso, Texas. He was a very busy man who put in 12 hours a day, 6 days a week in his wire manufacturing business. I remember once talking to him during a workday at the club when he let on that he was nearly 80 years old. I was quite surprised as I knew he was a bit older than the 25-year-old me, but I had no idea that he was "elderly" - he certainly didn't look or act his age. He told me that he started his business with his twin brother, who worked until he was 65 and then quit. Sadly, the brother passed away within a few months of his retirement. Frenchie told me that he was never going to retire. he felt that if he was useful and had a reason to get out of bed each day, then he would just keep on going. Rabbi Lapin makes a similar point. Even if you "retire" from your day job and do charity work, you should never just quit. It's good to have a reason purpose in life. Thou Shall Prosper - The Ten Commandments For Making Money (Amazon Affiliate link - as is the cover shot link above) is an excellent book filled with some great business wisdom. I highly recommend giving it a read.